Keeping equipment clean in food and beverage processing plants is of primary importance for smoothly run operations. This is, however, not an easy accomplishment. Firstly, workers must understand why cleaning is so important. Next, they must learn what soils are present, what surfaces need to be cleaned, which cleaning methods are best suited to their equipment, and what type of detergent will work best in each situation. Guidelines should be put in place so that procedures are standardized and uniform throughout the plant. Prevent transfer of ingredients from one product to the next. This is especially important when multiple products are produced on the same equipment. Proper cleaning is effective in removing trace ingredients to help prevent cross-contact of allergens. Reduce chances of food contamination that can lead to health hazards or affect product quality. Produce a quality product that tastes good and is well received in the marketplace. WHAT are Some Common Food Soils? Most food soils are traces of the various ingredients used in production. Other soils can include oils and greases from manufacturing equipment, dust, and mineral buildup from hard water used in the manufacturing process. Proteins, starches, greases, fats, gums, oils, and baked on soils are some of the more common foulants that are often found on food processing equipment. Each type of soil is unique and requires the proper detergent to thoroughly clean the surface. 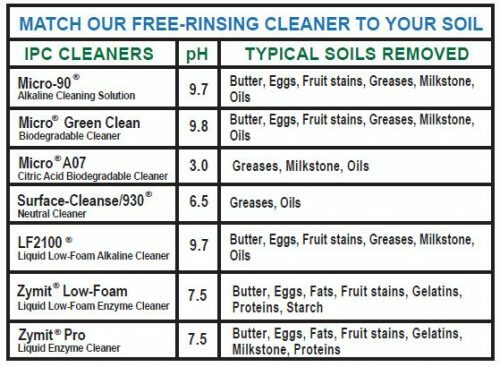 Use the table below to help match the most effective type of cleaner to each kind of soil. HOW Do I Create an Efficient Cleaning Process? Learn how to set up your ideal cleaning process with IPC’s “7 Step Guide to the Proper Usage of Critical Cleaners “. Cleaning should be done regularly and often. Clean surfaces and equipment help ensure smooth and efficient operations in the plant. When setting up your standardized cleaning procedure it’s important to include guidelines for cleaning frequency. WHO can monitor the effectiveness of my cleaning process? Your best source of technical guidance is the manufacturer of your specialty cleaner. Choose a cleaning product from a company that will continue to work with you long after the sale, offering technical support and guidance. International Products Corporation (IPC) assists their customers with validation methods and product testing. IPC has an on-site lab that works with customers to offer material compatibility testing, process and validation development, and residue analysis. Learn more here. All of IPC’s specialty cleaners are registered with NSF as A1 cleaners and can be validated in FDA processes. Contact IPC for more information or to request a free sample for testing.